Our sales from internet are 30% of our total sales in year 2012. 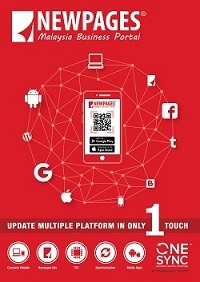 We trust NEWPAGES can help us to get more Malaysia market share in future! NEWPAGES services are excellent, with the weekly report provided can let us analyze the result very clear. Thanks to NEWPAGES. We really appreciate the excellent support from their staff which helped our business to grow a lot. NEWPAGES had increased our reputation and popularity. Customer get to know us through Internet and we meet more potential customers! Your service is important to our company, NEWPAGES had performed with our expectation! Keep it up and Thanks! We're very appreciating supports from NEWPAGES throughout our co-operation these years. Our business have grow up to 30% . After we change to NEWPAGES at May 2012, we start receiving inquiries and those inquires become deal. That is called Quality Inquiries. We strongly recommend NEWPAGES because their business platforms helped you to reach most of the potential buyers. We tried many traditional way to increase our sales, but I think NEWPAGES is the most effective, one of our strategic on internet marketing to increase our sales. Wonderful works done by NEWPAGES with strong supporting team in creating resultant force with ultimate extreme business exposure of my company.